Honestly, I don’t buy many pens over-the-counter (OTC) lately, having come to prefer the ever-changing selection available online. I’m pretty much a walking commercial for Jetpens, The Goulet Pen Company, and Daly’s Pen Shop. BUT, I happened to be in our local Staples store on Sunday for a quick errand, and couldn’t resist moseying around the store a bit. The pen section was full of the same, same, same been there/tried that offerings. On my way out, I came upon one of those free-standing pen displays. You know, the kind with pens on cords and a few scribble pads. Hmmmm…something new? Really? So I scribbled, as the pads urged me to do. AND I WAS IMPRESSED. AT STAPLES. After the inevitable “I don’t need any more pens”/”Yes I do” internal debate, I caved and picked up the AdvantNext (0.5 mm gel) model. 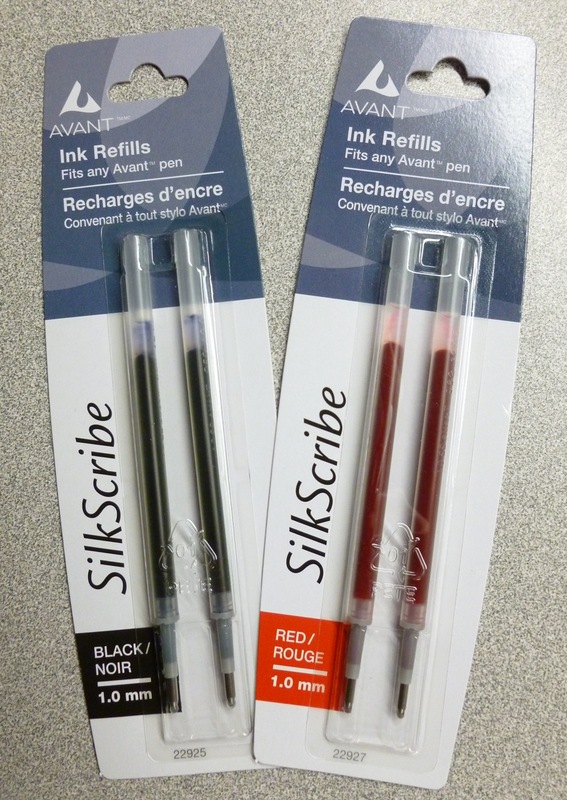 The whole Avant line is on sale so I selected a 2-pack of pens for $4.00, as well as two 2-packs of ballpoint refills (red & black, 1.0 mm) for a buck each. 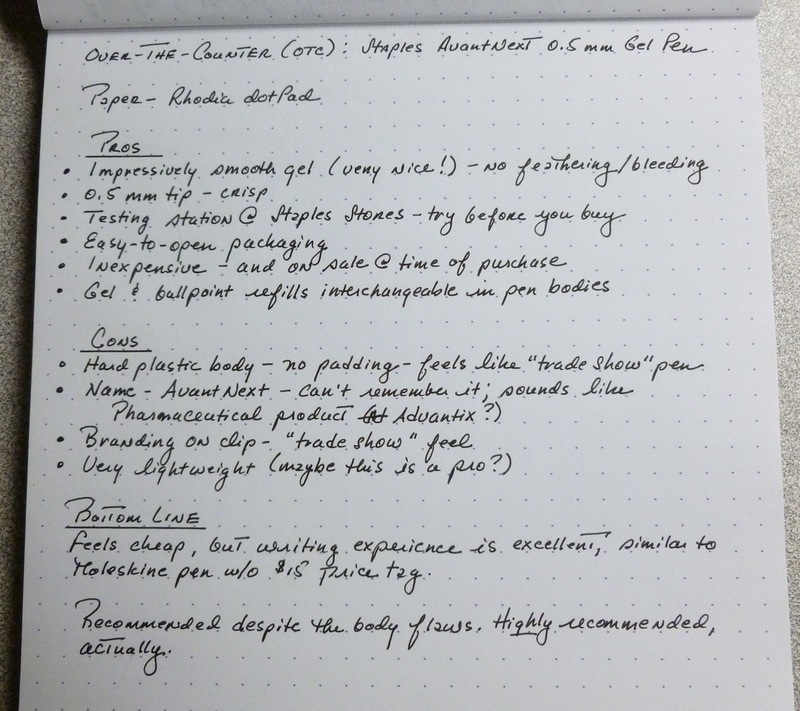 Why ballpoint refills? I’ll get to that in a minute. Besides the AvantNext (gel/plastic body), there’s also the AvantStyle (ballpoint/plastic body), and AvantPro (ballpoint/stainless steel body). 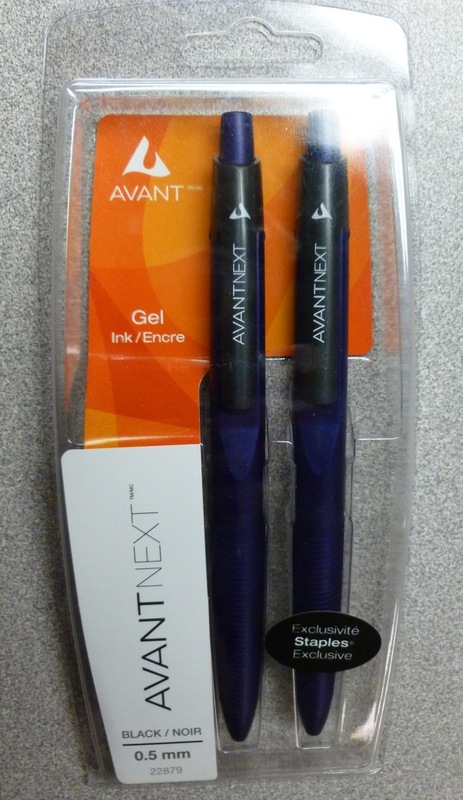 In the store, I was impressed by the performance of both the gel and ballpoint inks, and then I noticed a note on the back of the packaging that said, “Interchangeable ink system- works with any Avant ink refill.” Thus my decision to buy the gel PENS and the ballpoint REFILLS. I can mix and match as my pen mood changes. Kind of cool. I love the packaging, in that you can open it without cutting your fingers to bits getting to the pens. The front and back plastic pieces can simply be pulled apart. No scissors needed. It’s a little detail, but one that’s appreciated. I have to say that I really hate the name. Avant. AvantNext. Maybe it’s me, but I can’t remember it (I keep typing ADVENT! ), and it sounds clunky to my ear…more like a pharmaceutical product than a pen. Avant/Advantix. Pen/flea treatment. See what I mean? AvantNext branding & clip. Both look cheesy. The pen is lightweight plastic, and feels and looks like a pen you’d pick up at a trade show or from a pharmaceutical rep. It doesn’t scream, or even whisper, quality. 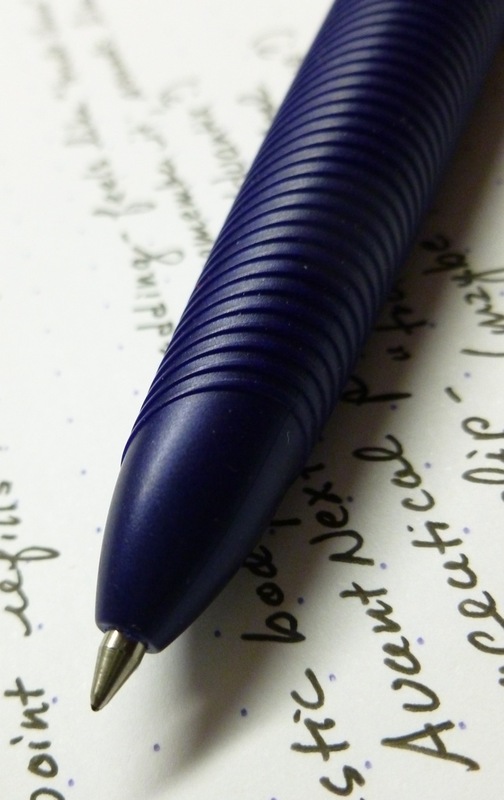 The grip area of the pen contains a ribbed section that’s made of the same hard plastic as the rest of the body. So don’t expect anything cushy. AvantNext grip. Nothing to write home about. Despite all of my griping about the cheap feel of the body and the not-very-catchy name, I am happily using this pen because of the wonderfully crisp, smooth, and dark line of the 0.5 mm gel refill. It really IS superb. There’s not a hint of feathering or bleed-through. It’s wet enough, but not too wet. Just perfect. The writing experience reminds me of the Moleskine pen, but without the $14.99 price tag. It so good, that I’m willing to overlook the el cheapo body and boring branding. 0.5 mm gel refill. Very, very nice. Drop what you’re doing and get to Staples. Stat.